Curious to know your current Mac Wireless Connection speed throughput? You can quickly learn how fast your Mac laptop or desktop is communicating via its wireless connection. Unlike Windows, Mac doesn’t show quickly how fast your wireless connection speed is. 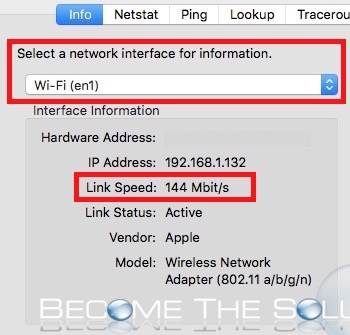 To display your Mac Wireless speed, follow these steps. 1. Go to Spotlight and type Network Utility and open it. 2. Go to Info tab and select your Wireless Interface, most likely Wi-Fi (en1). 3. Your Wireless Link Speed will be shown. This speed will always vary depending on connection strength and distance, wireless network type, and interference. Below is a chart to help you identify expected wireless speeds based on network connection types. Learn how to remove a wireless network on Mac or reset your Wireless settings on Mac. Finally, if you are trying to expand your home wireless network to another part of your house and want to use your same SSID network ID, follow this guide. Learning about how to enable iPhone hotspot and connect to Wi-Fi same time.